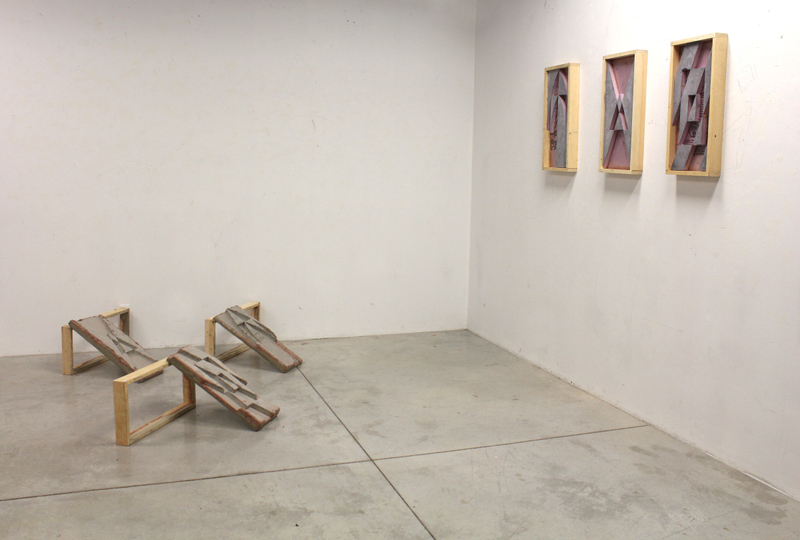 The McIntosh Gallery’s Student Projects Committee presents the Online Student Exhibition series. 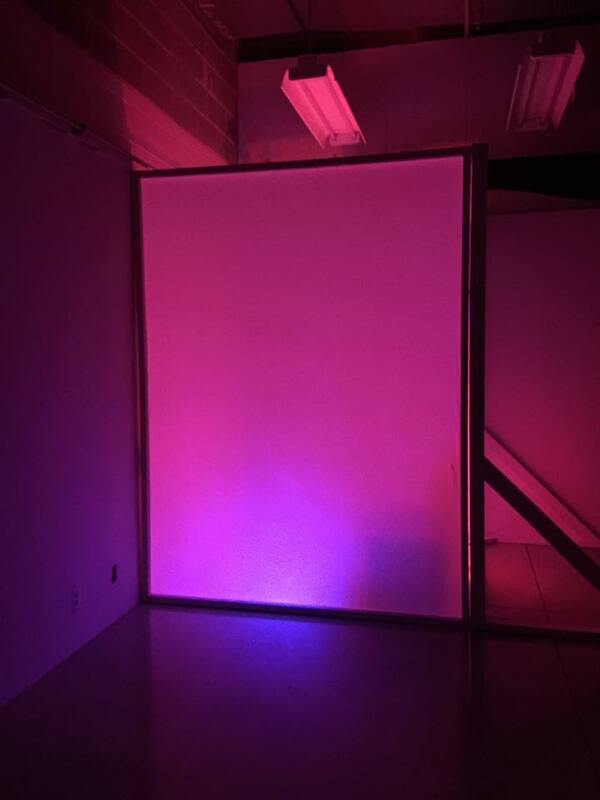 This online exhibition series offers emerging artists at Western University a chance to gain experience with submission processes while gaining visibility for their practice. The School for Advanced Study in the Arts and Humanities course, "Beauty and Aesthetic Experience" gets students out of the classroom to visit the university's McIntosh Gallery. Our readings in the history of aesthetics found a perfect complement in the Fall exhibit, "Portraits: Self and Others (it's complicated)." Director and exhibit curator, James Patten, gave us a tour of the paintings, photographs, and sculpture of over twenty contemporary Canadian and international artists, and discussed their diverse approaches to portraiture (hotlink to the past exhibitions page?) In response, students composed personal and critical reflections of their encounter with this group of artworks. Fourteen students made short video reflections. This video is my response to how imprinting females into our Canadian national narrative impacts me on a personal level, with clips from my own life. This video explores the idea of fragmentation of oneself and how it is presented in portraiture as a preservation method. In response to Wieland's O Canada, I acknowledge my own feminine identity and my intimate reaction to the piece through the sound of my heartbeat. Annie Li - thoughts on "portraits"
It is just after 2am on a weeknight. I have been playing Ariel’s Oven Baked Chicken Breasts for almost half an hour now, cooking a digital meal in lieu of the real one I should have prepared ages ago. Before this it was Barbie Driving Slacking, and before that an extremely questionable surgery game involving an inexplicably battered Princess Elsa from Disney’s Frozen. I can’t help thinking “I have to be up for work in four hours” and “How the hell does a Mermaid have access to poultry?”. Is this entertainment disguised as research, or research disguised as entertainment? Click here for the exhibition essay. Games for Girls from Samantha Noseworthy on Vimeo. Island of Misfit Toys from Samantha Noseworthy on Vimeo. The pieces in Laughing Back are so sure of themselves they possess an unmistakable agency. The artists included in this online exhibition produce work with an inherent confidence that first amuses and then strikes. Each grin is met with a glare and the works persist, demanding each of us to contemplate our stature against their sureness. Alexis Perlman and Danny Welsh address gender and sexuality, attitude, and adolescence. 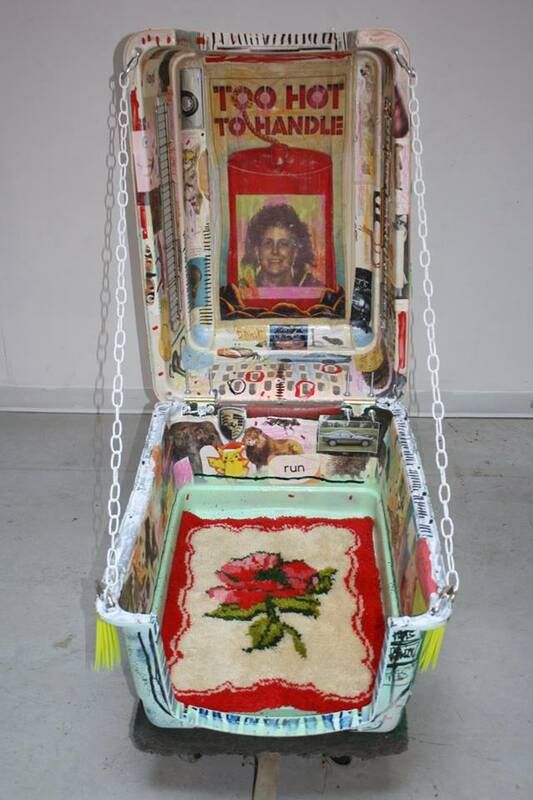 Both artists use found objects and sourced imagery in order to reference stages of development in individual and mass experience through symbols, referencing the craving for iconography held by cultural groups. 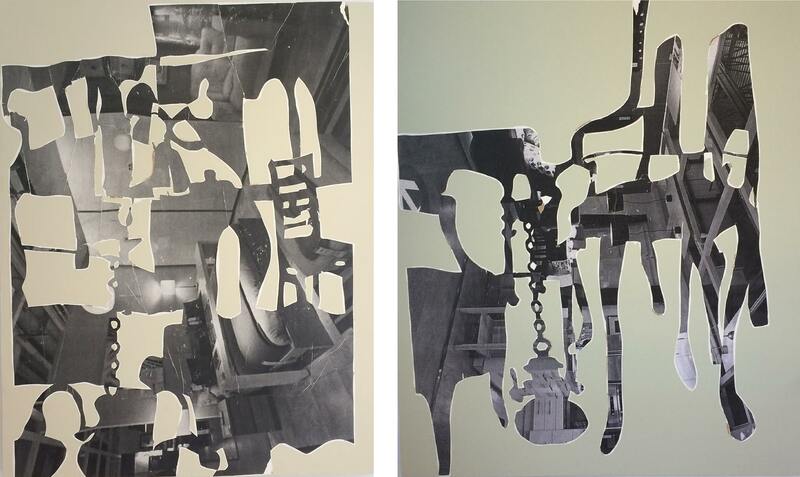 Alexis Perlman is an interdisciplinary artist with a focus on printmaking and sound installation. Perlman’s text and sound pieces stem from recorded every day dialogue. Situations of impaired articulation or confrontation provide the most interest to the artist who finds the experiences humorous and scary. Alexis Perlman’s prints from her project You’re a Usual, 2015 are approachable in their smallness but standoffish in their composition. With a grunge look and broken down imagery that alludes to digital signalling,(de)construction, and trendy aesthetics like tropical imagery and gradients, at first glance the works are inviting. Each print includes text elements that stand for a speaker, placing the viewer in a passive position who is left to contemplate the bold and preposterous statements in the prints. As the works relish in their arrogance they interrogate the subject and find comfort in their presumptuous attitude. The audience is left to question its place in regards to the phrasing. The accusatory tone achieved through the works composition removes the opportunity for judgement from the viewer as they contemplate their involvement in similar situations. Happy Birthday Vicky, 2014 again makes the viewer the subject. A glowing interior withheld from the viewer who is otherwise concussed by the booming volume of an audio recording. The audio records a number of dialogues, some small and passing and others loud and aggressive. The audio surrounds the audience, claiming full attention instead of demanding it. The blurring of voices and the melding of narratives causes the viewer to get lost in the plot while perhaps finding themselves (or bits of themselves) in the situation. Are we guilty of such crude and ludicrous behaviour? 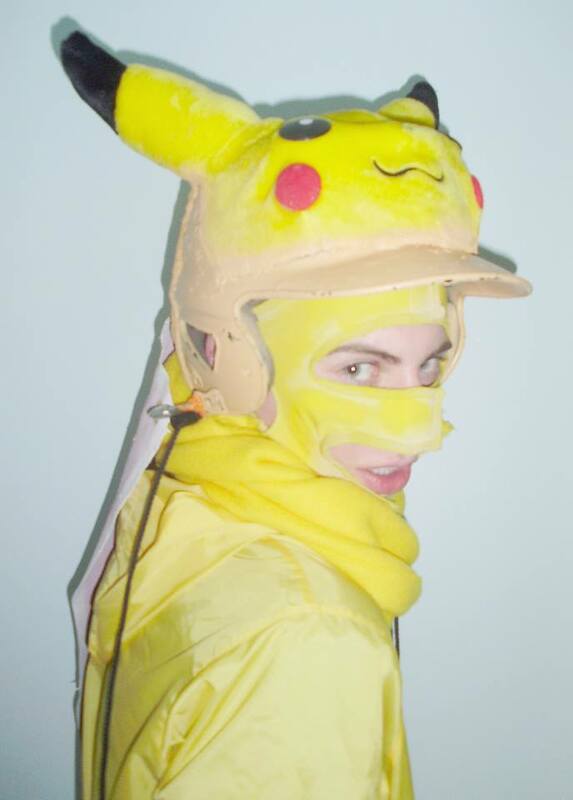 Danny Welsh’s work investigates aspects of gender and sexuality, superstition, and character performance. 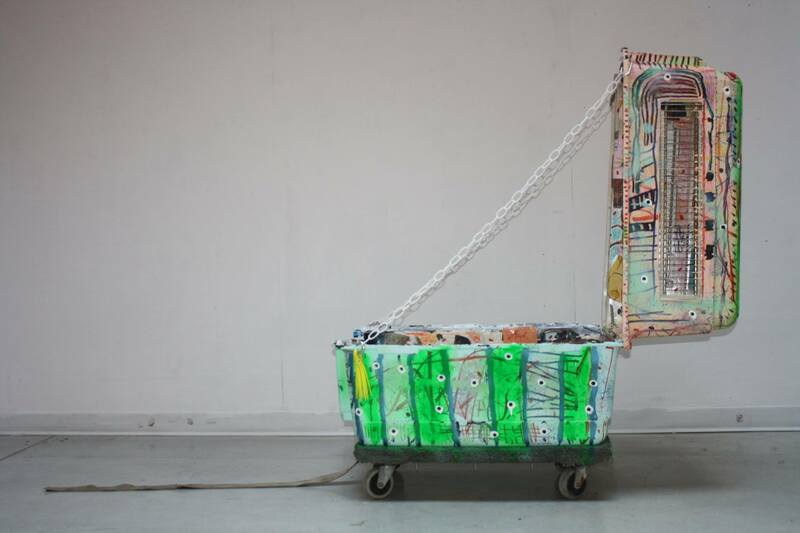 Welsh is an interdisciplinary artist with a focus on sculpture and performance, often melding the two with his wearable sculptures or by leaving performance elements in the space to exist as sculpture and evidence. 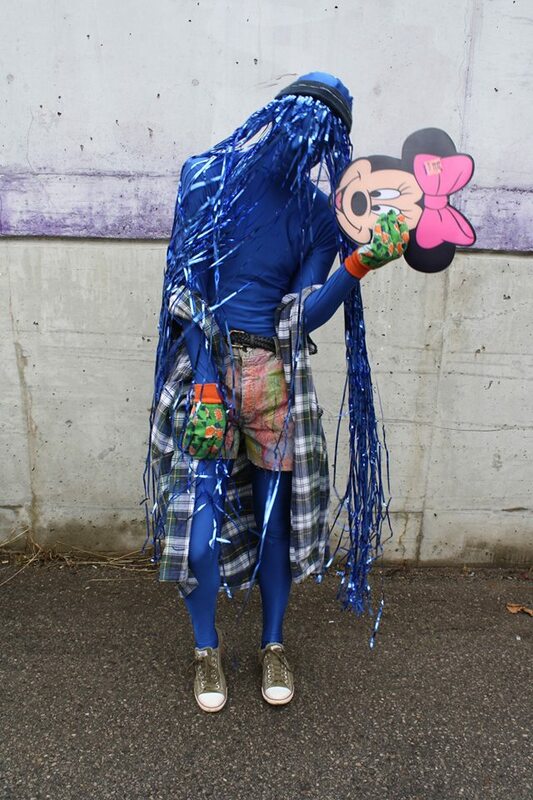 In his work Cradle, 2015 a being wears a blue morph suit and a plaid cut-off vest, metallic fringe wig, shorts synched tightly at its waist with a belt. The creature inhabits a dog crate turned club house detailed with a touch of childish mark making and a whole lot of image archiving in the form of adolescent room décor/dream board aesthetic. After inhabiting the crate, the creature then drags it behind itself as it pulls itself along a blue runway, using crayons to mark the runway like it had its space. The creature then emerges as if the marked runway is only now suitable and safe and fans itself with a Minnie Mouse placemat while strutting down the blue strip trailing its old home with it. After a few lengths the creature disappears into a nearby forest leaving its belongings behind. The performance questions notions of suitable space and one’s needs for inhabitation. Adaptation, whether of the self or of a space, is a central idea in the formation of queer communities. Welsh’s work is also anthropomorphic. The creatures that Welsh creates adopt features from various animals. In Knucklehead, 2015 a pig like creature fumbles about rambunctiously on rollerblades and juggles eggs while an audience laughs along to a laugh track. In Hare, 2015, a creature with big white ears who is simultaneously a beautiful siren and a threatening titan is preciously groomed like a bunny. Our response to these animals, and human attribution of these characteristics through certain attitudes and actions, is central to Welsh’s work. Adaptation through learned behaviour is necessary for survival. The adoption of these traits by Welsh’s creatures signals a difficulty when attempting to immerse themselves into a space. Welsh’s use of iconography is telling of stages of development. Imagery used to form and inform young minds remains relevant and trendy even when no longer deemed developmentally appropriate. By highlighting this trend in adolescent culture, Welsh probes the long lasting effects of nurture through development. To see more of Alexis's work click here. V: Thank you for being here, it is really nice to meet you. Why don’t you start by telling me what your inspiration for these drawings is? I: Well, when I go about these drawings I try to look for inspiration from things around me, but not necessarily something very personal to me. I find it really hard to work with things on an autobiographical level so these images were photographs of my friend’s portraits that I thought were very interesting so I decided to render them in a new way. V: So they are family friend’s photos? V: Would you ever consider traveling yourself and rending pictures you have personally taken? Do you think that would be something you would consider doing? I: I think so, yes, because the photos I use belong to other people. However, I think it is really hard to work with your own photos because there is also this issue of your own perception and how that translates and changes your process so you like how everything turns out. You need to be unbiased and have a critical and objective perspective of how something should be properly translated from a photograph to a drawing because that is a big decision process. For example, there could be a part of the photo you would want to take out, or a certain way you want to render it. These are all things that are easier to think about when it is on a less personal level. V: I noticed on your website you had made references to art classes you have been taking. Do you think that anything you have learned in those classes has influenced your work or exposed you to influential artists? I: Yes, I think that when we take these courses they are teaching you how to read images as a visual code. So, if we think about it, all pictures are a visual language and as artists we have to think about how to deliver it to people in a way that it can resonate with what you are trying to express in your artwork. On one side, it is important to use art as self-expression, but in another way you have to think about what they want to see and what they’re looking for because no looking is disinterested. Everyone’s looking and they’re looking for something. So in art when you look at a lot of works by other artists, and you see what works and what didn’t work, you start to realize what the audience or the mass culture is looking for or what they appreciate. I think one of the most important things I learned from all those art courses I am taking is to see art on a deeper level and to see how culture sees art as a visual language. V: Outside of that academic sphere, are there any artists you have come across in your own study or practice that have directly influenced you? I: I think a lot of artists on Instagram. There is one artist named Kei Meguro. She is a Japanese artist who uses pictures like mine. Joanne Name is also really inspiring for me. There is another Tumblr artist who likes to draw on sticky pads. They are all very up-to-date on technology and you can’t really talk about them in a classroom or academic setting because if someone asks you who your inspiration is, you can’t really say this person on Instagram. But, I think if you look at it from a different perspective, they do have a huge influence on us as artists because we are so influenced by social media. So we can’t deny that they are inspirations for us, but at the same time they are really difficult to cite; there are so many and their inspirations overlap with one another so it is really hard to pinpoint one person exactly. V: Do you have your own Instagram or any other sites that you use to promote your work? If so, what is your opinion on the possibility of others using your work as inspiration? I: I use Instagram to show my own artistic journey, but in terms of promoting, I don’t think I do as much of it because after all I am still in school so I think the priority for me is still learning how to process everything and grow my work as an artist. I think in the future, after I am done with school, I will focus more on promoting my work. V: What do you think is the most challenging part about working with your medium? I: There are a lot of limitations with working with marker. First of all, there is no colour and there is a lot of decision process because the only way to portray things such as depth or colour is to use pattern. So you have to use a variety of patterns to determine what works. 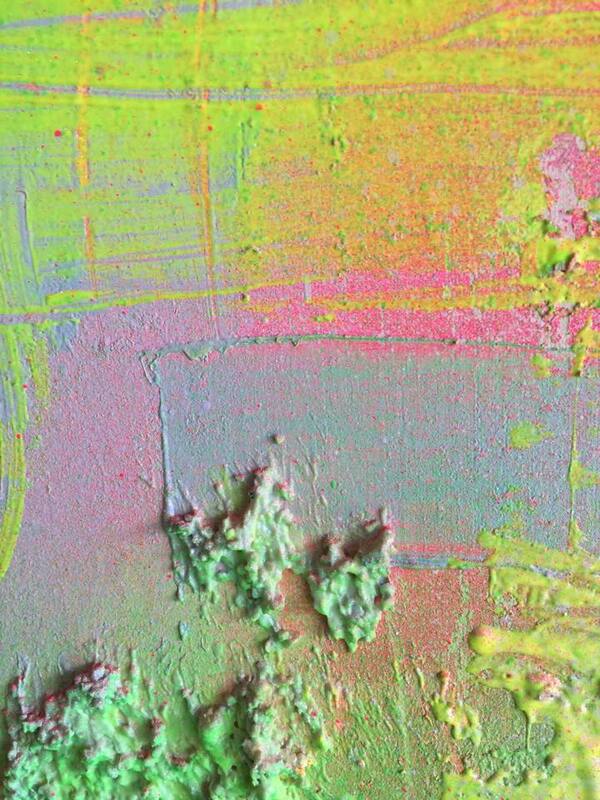 It is not like paint where you can just go over it with different colours. So, if I mess up I just have to throw it away and start again. A lot of the time the third copy of the same photo is the one I keep. V: And do you find within those two or three different renderings things drastically change, or do only minor things differ from one drawing to the next? I: I think that they do change and it’s weird because I think that it will look more realistic like the photo but they always turn out to be more comical. I think it is a process of elimination. Every time I redo something it becomes more simple, and I think that’s what people like; they do not want too much going on or it becomes too much for them to process. It is overstimulation in a way. Simple drawings are accepted in their own way and you really have to be careful about what you choose to omit or keep in. V: As a wrap up question, what is generally your favorite part about being an artist, and being a student artist in particular? In my installations and three-dimensional constructions, I am interested in the psychological impact that physical spaces can have on people. I aim to set up interactions with space that invoke spatial consciousness. I have explored ideas of topoanalysis, the psychology of vantage points, and the spatial misconceptions inherent to memory. My work manifests the phenomenological notion that every understanding we have of the world is based on experiential human consciousness. 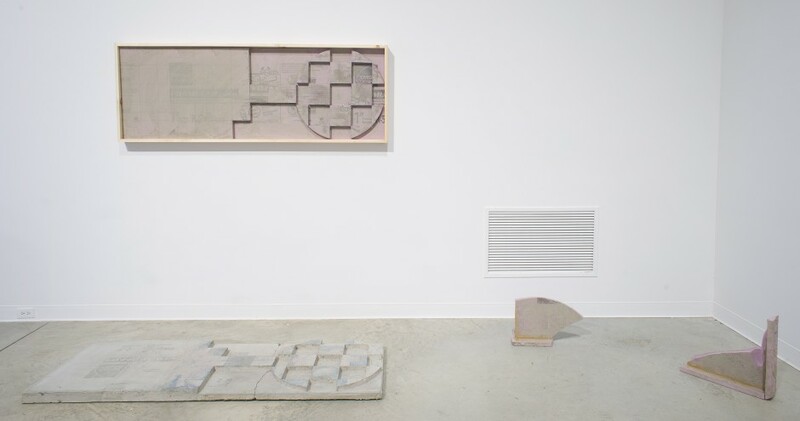 Adding Up, 2015, concrete, oil paint, insulation board, wood, 240x240x300 cm. My paintings are more existential than phenomenological, as they address what is problematic in urban spatial experiences. I believe that postmodern cities overwhelm their inhabitants with images and information, and that these distractions inhibit the human capacity to understand the self. My paintings present noisy, urban ciphers as metaphors for the busyness of the world. Red, 2014, oil on canvas, 60x90 cm. Blue, 2014, oil on canvas, 75x100 cm. Adding Up No. 2, 2015, foam insulation borad and wood. 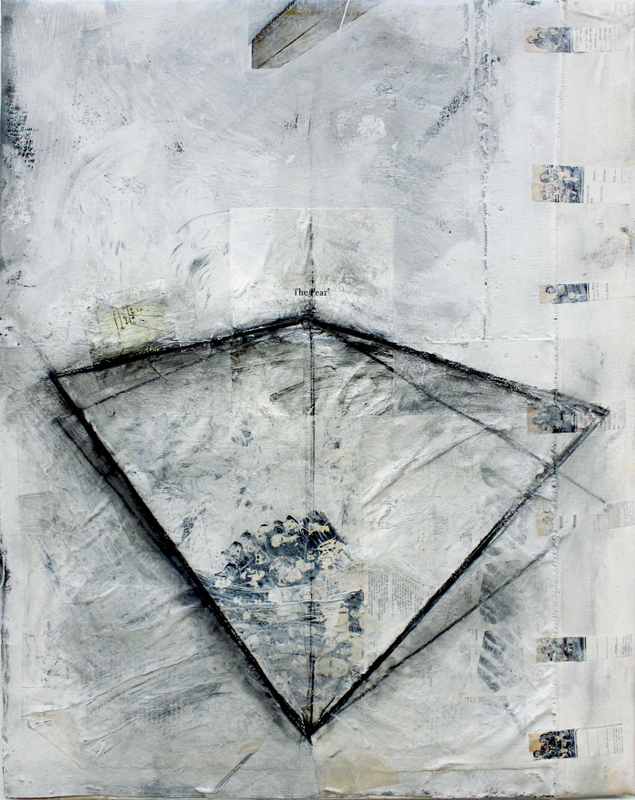 Untitled, 2015, acrylic, charcoal, and paper on linen and canvas, 61x76 cm. To learn more about Reddon's practice check out his video interview with the Student Projects Committee here. The term “sweet tooth”, though quaint, is unapologetic and unmistakable. It acknowledges a preference for sweet things. If we take this two-word badge-of-honour and break it down, we find an interesting juxtaposition: sweet and tooth, one implies play and joy, the other signifies the beginnings of digestion. 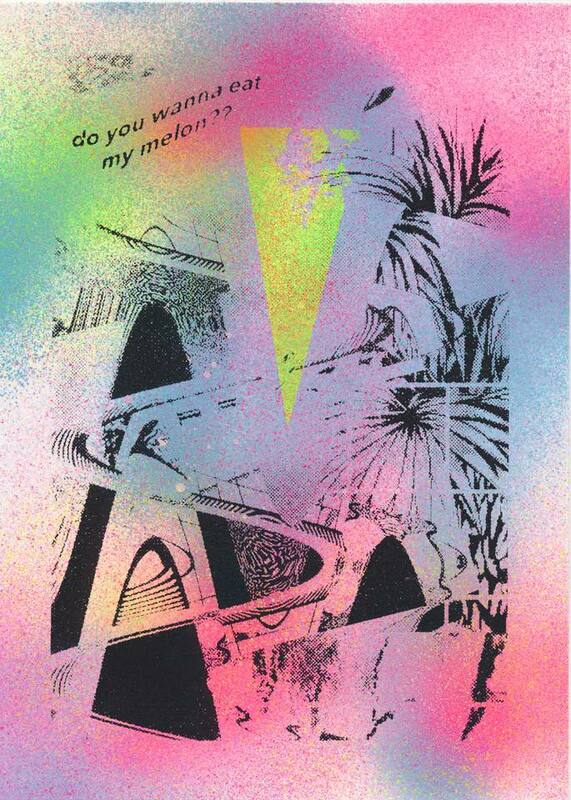 The works in this exhibition by Alexis Perlman and Jacob Aaron Schroeder are selected on this merit. They are intended to satisfy our cravings with their visual sweetness while calling upon the viewer to critically examine their affinity for certain aesthetics through their material application and composition. 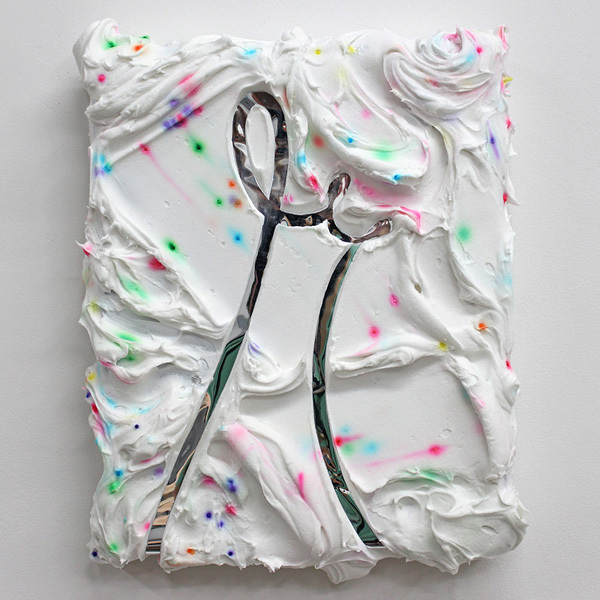 Jacob Aaron Schroeder is a Minneapolis based artist whose recent work could easily be mistaken for the top of a cake. 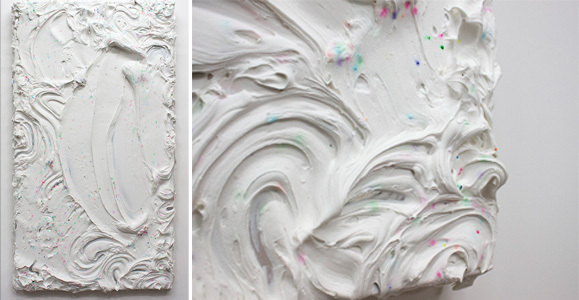 A mixture of acrylic and rainbow sprinkles applied liberally to a surface references both gestural abstraction and the process of icing a cake. A comparison that is undoubtedly delicious. Like Ron Martin’s Black Paintings from 1974-81, Schroeder’s negotiations with the surface are visible. The artist works in a gestural manner that mimics the icing of a cake. 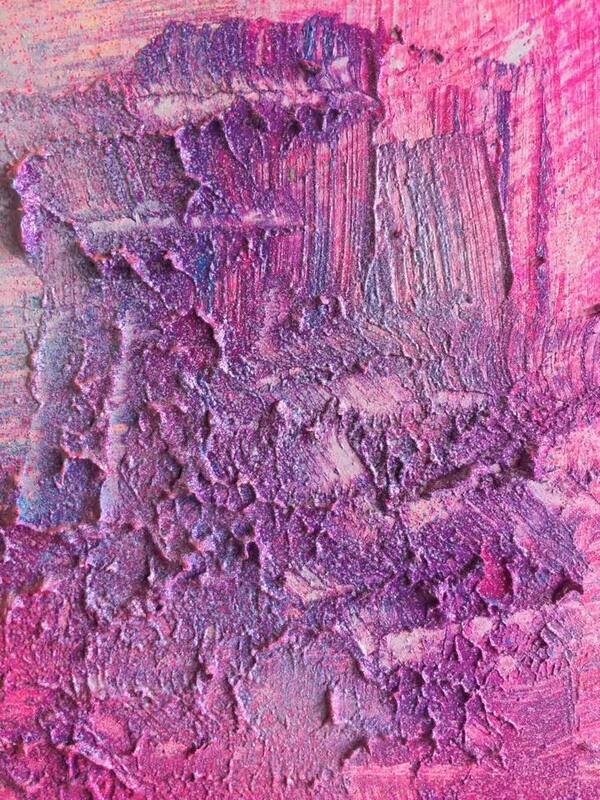 As he smoothes the acrylic icing, evidence of the act is left behind in the paintings’ sumptuous excess. With his Moments series and A Misgiving, Schroeder challenges our understanding of our own consumption by looking at how we satisfy ourselves with his visual effect. Because we can equate the works to a cake through their visual effect, we are reminded that our digestion of a cake is just as visual as it is physical. This aesthetic gesture has somehow become pertinent to the object; a physical and notable characteristic of its being. Its visual effect –even without consumption- still elicits joy, just as the dessert marks the celebratory ritual of singing at a birthday party. 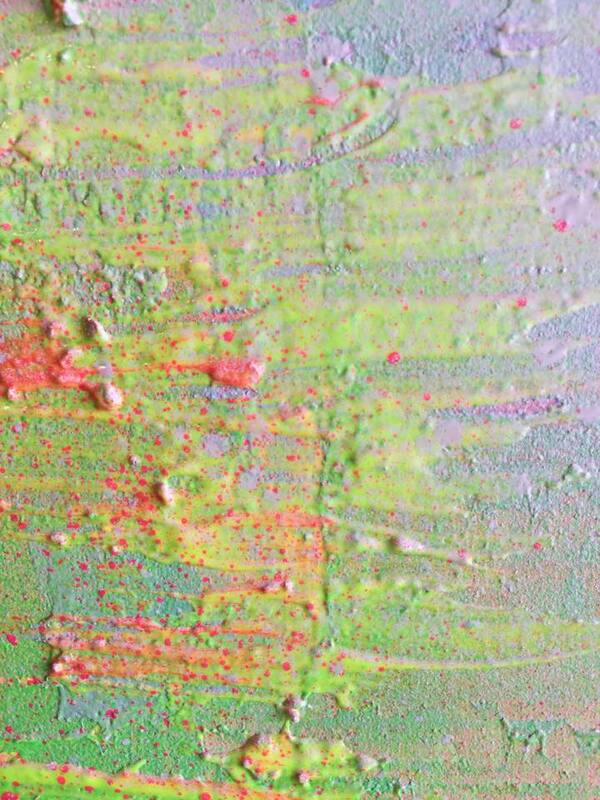 The smearing and blurring of the sprinkles -a distinguishing characteristic of the works- offer their own point of contention. The running of colour from the sprinkles to the icing, in the language of baking, would signal that the cake has likely been sitting for some time and isn’t fresh. From Schroeder, this is accusatory. It points a finger at the staleness of this design technique, suggesting that it, as a trend, is tired. Materially, this also suggests a temporality associated with the design. The effect in its staleness is temporal. The colour from the sprinkles will eventually disappear perhaps to suggest the impermanence of design while also recognizing that the temporality of a trend, no matter how long lived, is an essential element to it’s existence. The trend is marked as having an expiration date. Perlman’s recent photographic work is sweet but in more of a gnarly-extended-eeee way, investigating adolescence through material behaviour and aesthetic. In this series of photographs, images are sourced from paintings completed by the artist. The shots bring us a lot closer to the details of a painting that we might normally overlook so not to sacrifice our comfort in the gallery. The artist acknowledges our affinity for certain colours and uses these bright, neon, and pastel colours as a ploy to capture the viewer’s initial interest. 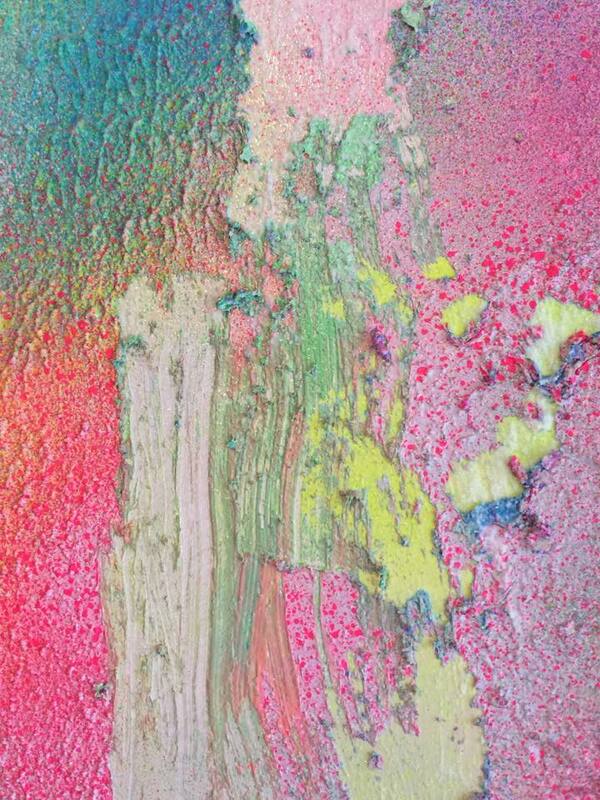 The images document scratches, clumps of accumulation, and layers of colour that just expose even more colour. With every method of removal, Perlman references a choreographed, strategic destruction in which an object is reworked. Though the artist’s gestures seem violent and careless they are planned interventions that mirror the destructive, rebellious, but also accessory nature of the types of graffiti that are ever popular in adolescent culture. The process of (mis)treating an object to increase value (like store bought ripped jeans or edited digital images that look like light-leaked dialogue) is a practice evoked in performative and aesthetic destruction of the artist’s own work. To learn more about Alexis Perlman's work click here. 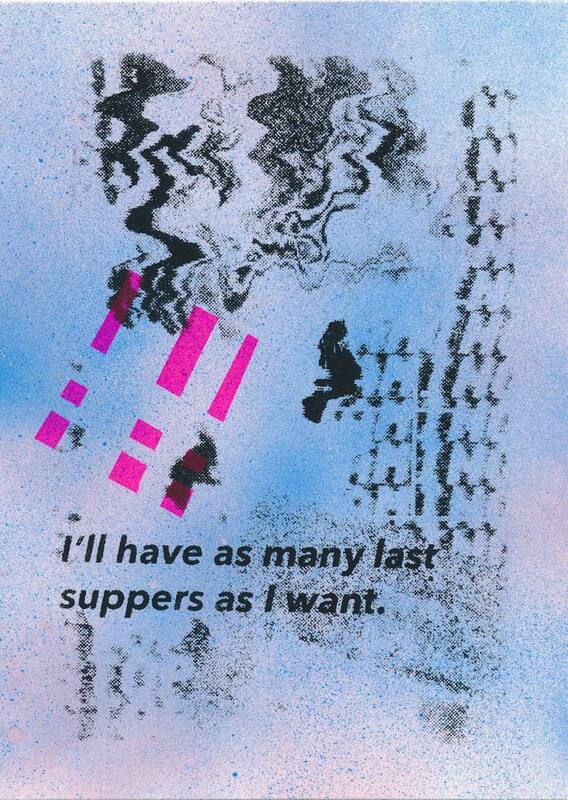 To learn more about Jacob Aaron Schroeder's work click here. 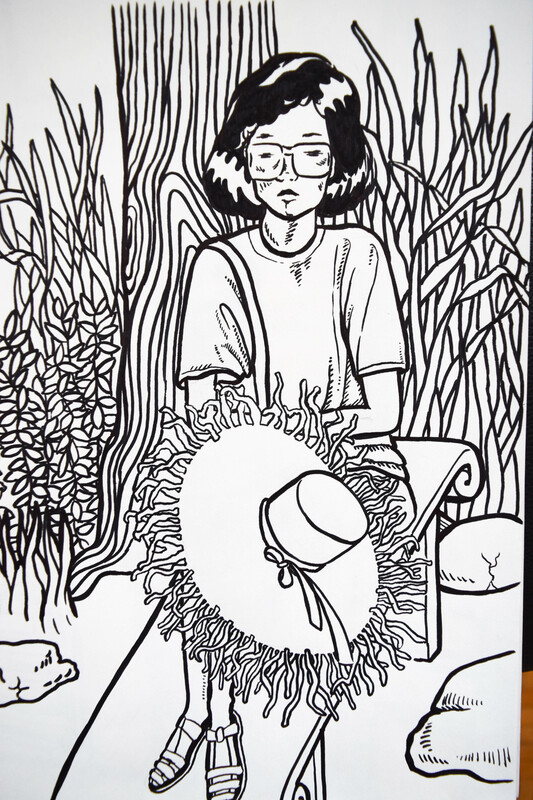 To learn more about Lucas Cabral's work click here. 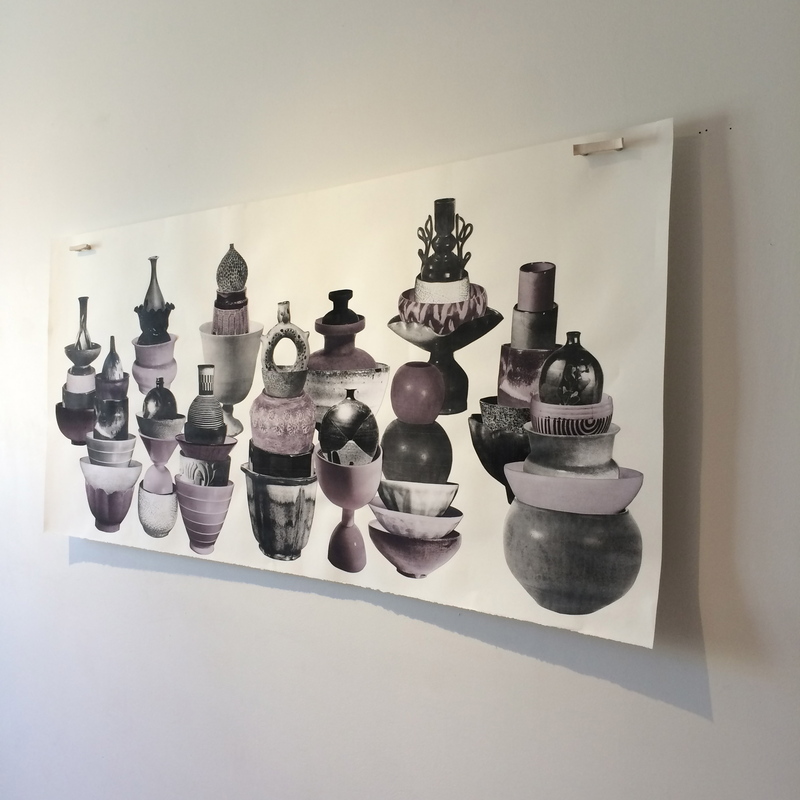 Past, present, and future intertwine in this selection of photographs, sculptures, and drawings by MFA student, Quinn Smallboy. A sense of tranquility imbues intersecting lines and planes of space—hallmarks of Smallboy’s work. The diversity of mediums underlines Smallboy’s more conceptual exploration of binaries; particularly what it means to be a contemporary, indigenous artist today. 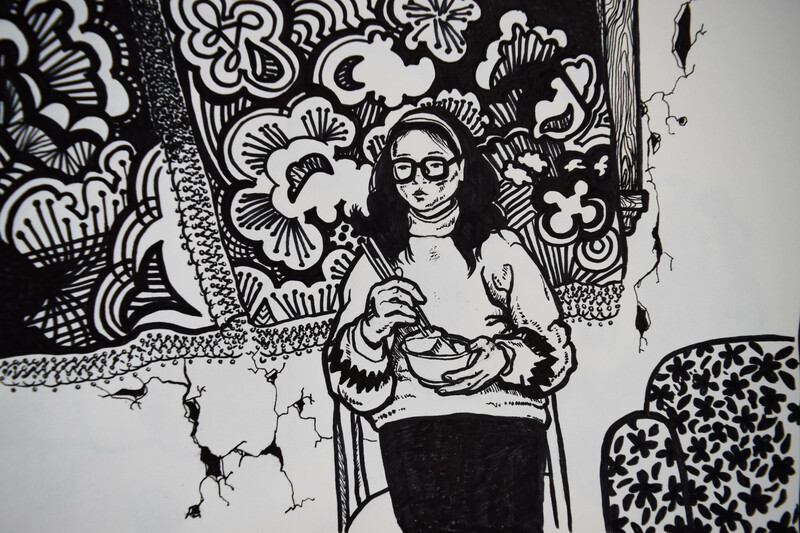 Where is the line drawn between what an indigenous and a contemporary artist might be? 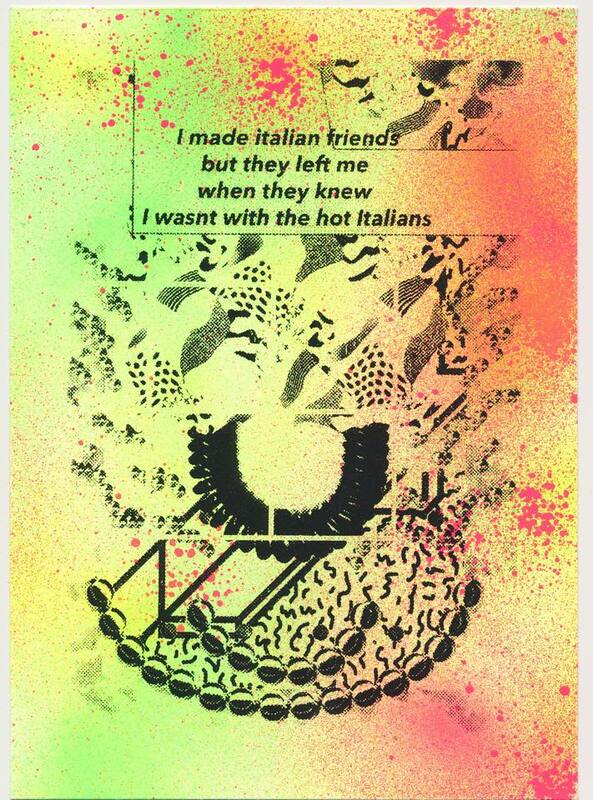 And how do such artistic labels intersect, or even become useless? While the artist’s heritage certainly informs his practice, many of his works do not engage with such narratives, further underlining the contemporary-indigenous binary that is so central to his practice. Conceptual explorations of line and space divorced from indigenous subject matter are equally vital. Indeed, binaries such as absence/presence, materiality/immateriality, or calm/tension permeate the works. However, rather than mutually exclusive entities, these binaries are oftentimes fluid or, at the very least, intersectional. Inspired by personal histories and traditions, Smallboy considers contemporary indigenous issues, yet his artworks transcend the present moment. Suspended in time and space, these works point to both past and future. Working in a minimalist aesthetic, the artist questions how past indigenous narratives may manifest in the future all while being negotiated in this moment. 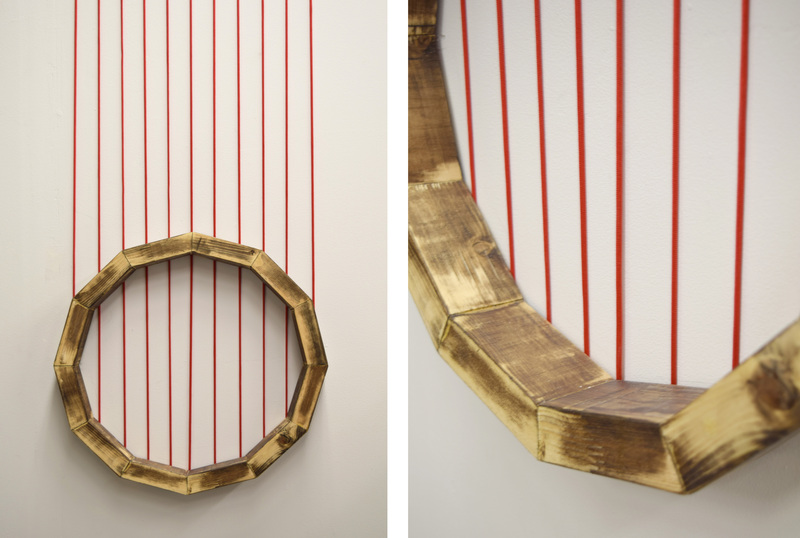 Owing to pared down materials, such as wood and rope, many of the works point to formalist elements. Smallboy uses these commercially accessible, that is, decidedly non-traditional, materials to subvert common indigenous symbols. To a large extent, the artist’s creative process is guided by intuition and chance, which opens up the potential for infinite possibilities. While lines of rope are often pulled taught and precisely anchored, they achieve such qualities through an intuitive methodology that responds to the surrounding space. Lines becomes trajectories of cultural histories and perspectives, continuous through time and space. To read an extended exhibition essay click here. 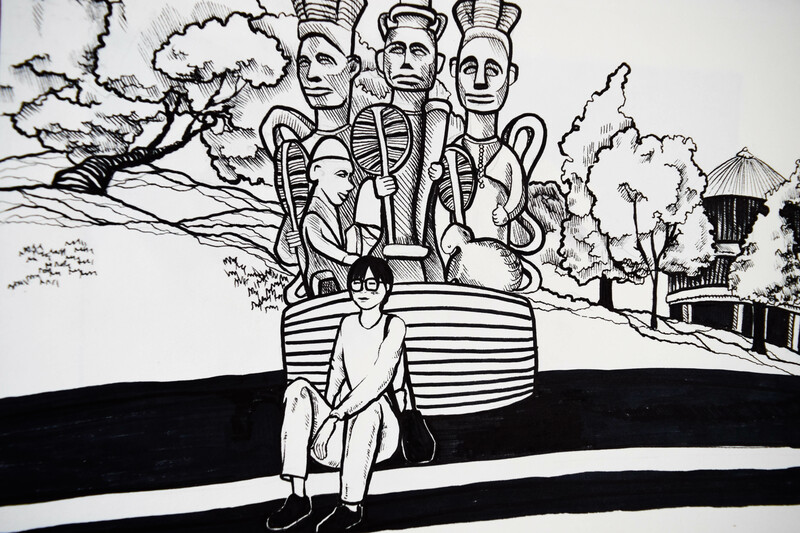 Carling Spinney is currently finishing her MA in Art History at the University of Western Ontario. Her research focuses on alternative exhibitions in a contemporary, Canadian context. Spinney is an aspiring curator dedicated to a career in the arts. 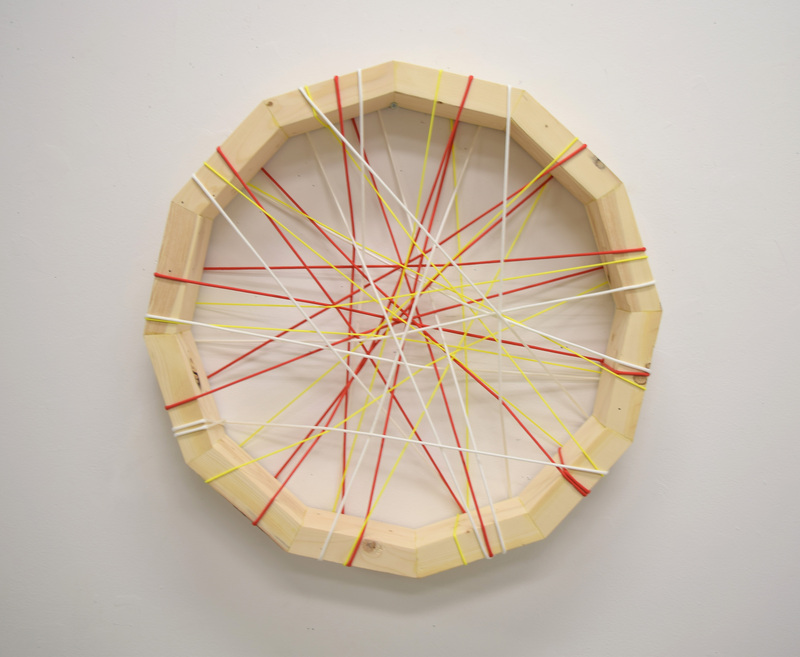 Untitled 2016, black ink on paper, 8" x 11"
Untitled 2016, black ink on paper, 11" x 14"
Yellow+ White + Red 2016, wood and nylon rope, 23" x 3.5" x 23"
Mask 2016, wood and nylon rope, 18" x 3.5" x 18"
Red 2016, wood and nylon rope, 19" x 2.5" x 19"
Line Morphing 2015, MDF board and nylon rope, 4" x 5.74" x 13"
Line Spacing 1 2015, photograph, 20" x 30"
Line Spacing 2 2015, photograph, 20" x 30"
The domestic sphere hangs precariously between the personal and the societal. At once an expression of individual taste and cultural trends, the way we decorate our homes reveals, perhaps more acutely than any other artistic endeavor, the hopes and fears of our age. In this collection of works, artist Sarah Munro manipulates and decontextualizes images of domestic decoration, demanding consideration of the meaning imbedded in these objects. This is all new territory for Munro, who is currently an MFA candidate at the University of Western Ontario. Thematically, Munro's interest in interior decoration grew out of observing her peers as they became first-time homeowners, filling their houses with curiously similar items that they bought at the nearest big-box store. What motivates these specific (and monotonous) choices in furniture, wall colour and décor? Why do we willingly embrace poorly made, mass-produced goods? These questions haunt Munro's work, forcing the viewer to confront the decorative choices that are often made without a second thought. Inherited Vessels #2, archival pigment prints on matte photo paper, ceramic magnets on acid free paper, 35” x 50"
Live Laugh Love, Digital Collage, archival pigment print on acid free paper, 5.5” x 8.5"
Sarah Munro’s work currently investigates the blurred lines between fine art, craft and domestic décor. 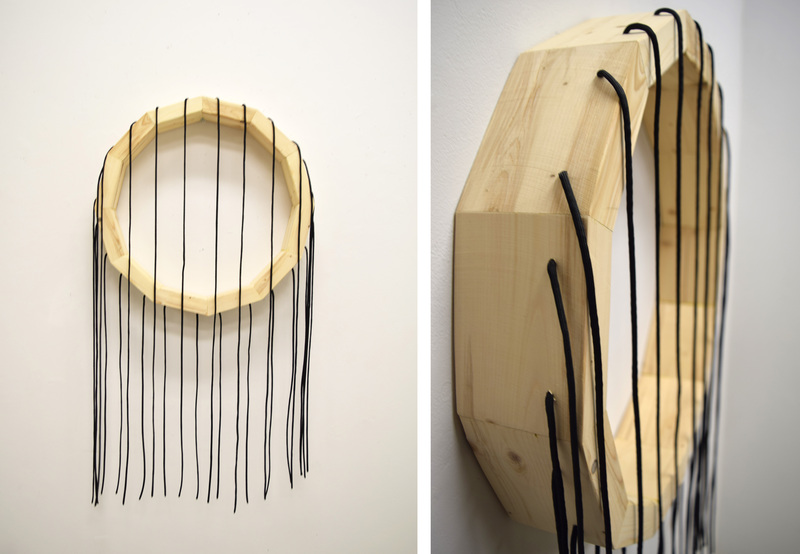 Originally from London, Ontario, Sarah Munro received her BFA from OCAD University, and is currently an MFA candidate at The University of Western Ontario. 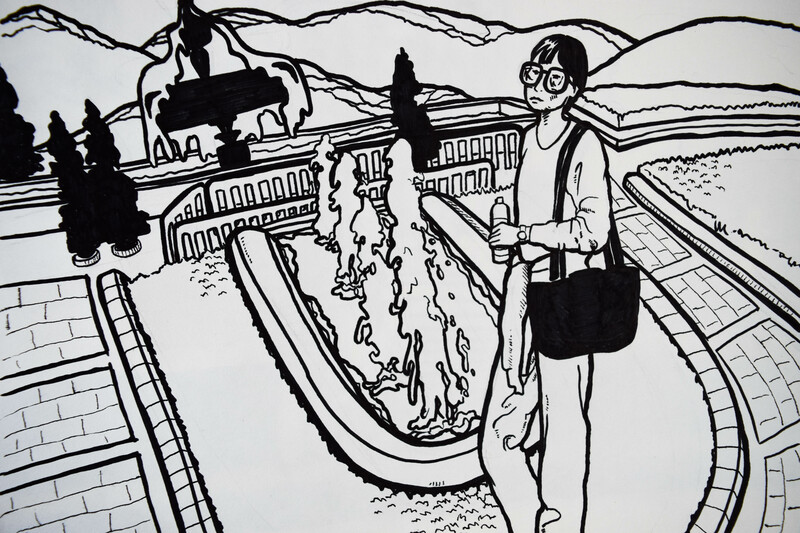 Taylor Davison is currently finishing her MA in Art History at the University of Western Ontario. Her research focuses on late nineteenth century decorative art, specifically the domestic textiles of William Morris. Davison aspires to a career in arts education.